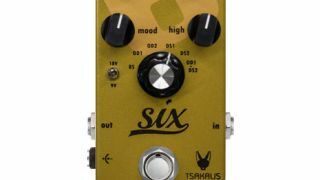 Tsakalis Audio Works has introduced the Six, a fully analog booster-overdrive-distortion that the company says is “designed to deliver the great tones and feel” found in three classic pedals—the Timmy, BluesBreaker and KOT. The pedal’s name derives from its six different modes—Booster, Overdrive 1, Overdrive 2, Distortion 1, Distortion 2 and Overdrive 1 into Distortion 2—which are selectable via a six-position rotary switch. The pedal also incorporates what Tsakalis calls “cap-less” technology, with all the capacitors removed from the audio path, which the company says contributes to a more natural sound without any added compression or color. The Six B.O.D. is powered by a 9V supply, with a voltage switch that allows the user to select between 9V or 18V. Tsakalis is offering the pedal for $243.